Actually, I was reading his blog when I found out that Firefox 3 Beta 3 is out. You can download it here. I’m playing the naive user for now… just installed it and using it, without reading up on the specifics of the new features. I’m trying to see what I actually notice without any prep. First thing… it’s FAST. Much faster than Firefox 2. And much much more stable with lots of tabs left open, although I need to give this a bit of a test through the weekend. Anyway, everything is faster with Firefox 3. My eBay loads faster. SYI 3 loads faster. WordPress.com loads faster. Email links that open URLs in Firefox open faster. And when I launch with a dozen or more tabs, it feels much more stable, not locking up nearly the way that Firefox 2 did. I’m noticing on Mac OS X (10.5) that the controls look a little goofy. The small controls used on eBay now come out as Mac-like round buttons, but the font is off-center. Also, the drop-down menus actually have their text one pixel below the end of the menu control. This is stuff I’m sure that’ll get fixed by final release. We’re obviously going to have get busy updating our LinkedIn toolbar – Firefox 3 informed me the current version isn’t compatible. I use that toolbar every day, so I’m going to have to make sure that gets fixed. 🙂 In fact, none of my toolbars were verified to work with Firefox 3, which is probably a good thing since I don’t use most of them anymore anyway. I’ve been very happy with Firefox vs. Safari since I switched about two years ago. I was debating whether Safari 3 and the rise of the iPhone meant I would eventually have to switch back to Safari as my primary browser. It’s not final, but my first few hours on Firefox 3 has left me fairly confident that Mozilla will continue to be my browser provider of choice for the foreseeable future. That a great web browser can be built as a stand-alone application, not as a component of the OS. That a great web browser can be built on the Mac by a company other than Apple. These were, of course, the two nominal reasons that Microsoft gave back in 2002 for dropping Internet Explorer on the Mac. As Apple market share continues to grow, and the concept of an all-Windows workplace fades, I have to wonder – will Microsoft ever reconsider providing IE as a cross-platform browser again? Even if the Mac has a low (5%) market share, that doesn’t mean only 5% of companies will have Macs deployed. It could turn out that a vast majority of companies end up with a minority share of Macs in-house. Does Microsoft really want to cede the cross-platform web application market to Mozilla? Somehow, I doubt this is being seriously considered in Redmond. But it’s definitely interesting in the face of a resurgent Mac platform and a cross-platform Firefox & Safari. Internet Explorer for the iPhone, anyone? StumbleUpon is more powerful than I first thought. In case you haven’t tried it, StumbleUpon is a fairly unique new tool to help browse the web. It’s a toolbar that you can easily download and install in your browser (IE or Firefox). With it, you can easily vote “thumbs up” or “thumbs down” on any web page you go to, kind of like Tivo. As you vote for websites, StumbleUpon compares the sites you like to the sites that other people like. Then, when you click “Stumble!”, it automatically takes you to other websites, most likely ones you haven’t heard of, but that StumbleUpon thinks you’ll like. My first impression of StumbleUpon as a user was positive – it very quickly started taking me to Mac-related sites, many of which I hadn’t heard of. It was neat, but since I rarely have time to just randomly browse the web, I didn’t use it much. I didn’t give StumbleUpon much more thought, despite all of the eBay/StumbleUpon acquisition rumors, until today. For the first time, this morning I decided to actually vote for my own blog, Psychohistory, with StumbleUpon. I didn’t think much of it at the time. Why not a little self-promotion? Tonight, I checked my blog statistics, and the number one referring site to my blog today was… StumbleUpon. 29 hits out of 380 total. That might sound like a small number (it is), but I’m just shocked that a single vote could bring traffic to my blog. Something real is going on here… reading the WordPress forums I see that a lot of blog authors are getting thousands of hits a day from StumbleUpon. If any of that is hitting my blog, then there must be a fairly significant flow sourcing from StumbleUpon users. In any case, if you haven’t downloaded StumbleUpon yet, it’s worth checking out. And if you run a website, it’s worth thinking about how to best get people to vote for your site in StumbleUpon. This page on the StumbleUpon site helps you integrate their tags into your pages. What Do You Do When You Catch Mozilla & Microsoft Dancing? OK, sensationalist title for some trivial pictures, but these were too good to pass up. Don Dodge posted some images from the recent Mix07 conference. 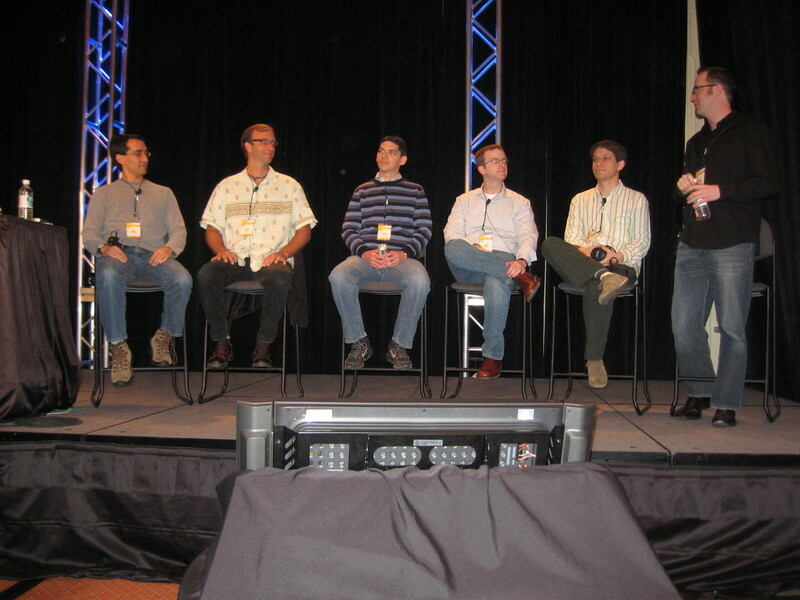 Pictured left to right: Sam Ramji – Microsoft, Rob Conery – SubSonic, Andi Gutmans – Zend Technologies, Mike Schroepfer – Mozilla, Miguel de Icaza – Mono, Novell, (William) whurley – BMC Software. Not sure why this cracked me up, but it did. I’m sure the novelty factor of seeing pictures of friends will wear off… but not yet. Yesterday, The Venice Project. Today, Joost. Tomorrow, Yours. There is a lot of coverage today about the official unveiling of The Venice Project, now called Joost. You can easily do a search on Google News for Joost – I’m sure it will be in all of the papers tomorrow. Joost is the latest and greatest attempt to bring high definition video to the internet. The reason it is getting so much attention is simple: Niklas Zennstrom and Janus Friis. They are the founders behind the infamous peer-to-peer music service, Kazaa, and more recently, the voice-over-IP phenomenon Skype. The Venice Project is not just another online video start-up. The Luxembourg-based company is the latest co-production of the two-person hit factory of Niklas Zennstrom and Janus Friis. The founders of Kazaa and Skype are hoping that The Venice Project will upend the television experience just as their earlier efforts turned the music and phone businesses on their respective heads. And while the glam duo might hog the headlines, the task of making the Venice Project a reality falls on the shoulders of Fredrik de Wahl, a lanky Swede with a quiet demeanor who has been a cohort of Messrs. Zennstrom and Friis for more than half a decade. Before reading his piece, I had no idea how much of the Joost application was built over Mozilla. Very interesting, and a smart move in the current environment where the market will not reward you for rebuilding UI and application frameworks. It will reward you for quality of user experience, and of course, our good friend time-to-market. The Joost website is fun to read – you can sign up for the Beta if you are running Windows. You can also enjoy the colorful design of the sight, and the flowery Web 2.0 language. I had the opportunity, briefly, to meet Niklas & Janus in December while attending an eBay leadership conference here in San Jose. I cannot pretend to know them well, but it is immediately striking when you meet them how passionate they are about user experience and simplicity, and how direct and honest they are with their comments and discussion. I’m not sure how to resolve the limitations of our current broadband infrastructure in the United States to allow for the peer-to-peer distribution of content like high definition television, which is just incredibly large. It’s so large that a Tivo Series 3 requires a 250GB drive just to store about 30 hours of it. Hard drives are big, but the upload support that most people have from their ISPs is quite small. For example, I get 3Mbps download from Pacific Bell, sorry SBC, sorry AT&T, but only 1/4 that is available as upload capacity at 768Kbps. That means it’s possible for me to download video, but hard for me to use my upload service to “share” the content with another user. In any case, I’m glad to see The Venice Project come out from under wraps. Let’s see if Joost becomes a verb the way that Skype did.